If you desire a general reading, then, once again be open to what is being presented to you. Some information is confirmation of where you are at, why you are feeling a certain way, and what is coming up for you. Be sure to make yourself comfortable before your reading. Find a quiet place with no outside distractions. Crying children, barking dogs, or loud music will make it unnecessarily difficult for your reader, and yourself. For example, do not call your psychic on a cell phone… while driving down the highway with your window down… (yes, this has happened to me). Avoid burning bridges by becoming abusive or confrontational with the reader if you did not receive the outcome or information you were expecting. Do not come into a reading in a combative state. It would be counterproductive to your experience. Being relaxed and open to the information being shared with you will ensure a good experience for both you and your reader. Do not use your psychic as an emotional ‘punch bag.’ You will most likely only end up feeling really bad about it later on, once you have calmed down. Sometimes clients have just been through a traumatic event or they are emotionally overwhelmed, so it is understandable that they may react this way. But ‘shooting the messenger’ serves no purpose. The vast majority of psychics and mediums are good people who always mean well. They truly want to assist, help, heal, console and guide. If you mistreat them, they will be less than open to reading for you again. Picking the right psychic for you can be most helpful. Below is a short list of some of the different abilities and tools that are used to get the information you may seek. Dream interpretation is best done by a psychic that specializes in that arena. Dreams are rarely literal. Each color, setting, and situation means something and it does take a gifted interpreter for you to receive your message. I have had some clients with reoccurring dreams. Interestingly enough, once you receive the message the reoccurring dream usually stop. Tarot is a divination tool that presents the future as it will be if you change nothing. The future is based on your current situation, if you do nothing. The Tarot will tell you what will happen if you stay on that particular path, or if changes are made within yourself or about yourself. Numerology is based on your birth date and name to provide you with insight on certain events in your life and your life path. It is helpful to see what gifts you were naturally born with. Mediumship is a spirit connection with passed loved one. At no time is there a guarantee that any contact will be made. Mediums rely on the presence of non-physical energy outside of themselves for the information relevant to the person they are reading for. Channeling is a form of mediumship in which the psychic goes into a trance state and channels energies or spirits to receive messages. The spirit works through the reader, who passes information on to you. Astrology uses planetary influences to pinpoint opportunity and challenging times. A chart is created for a person based on their birthday, time and place of birth. The chart can also suggest basic personality traits of the individual. These are helpful not only for the individual, but I have found it is helpful when you need insight into another’s individual personality. I have sought out astrologers myself to gain this kind of insight, since Astrology is not my personal strong suit. If you feel you have not connected with the reader, do seek out someone you are comfortable and do have a connection with. In general, be open to the experience, find a gifted soul that you personally connect with and a wonderful relationship will unfold. 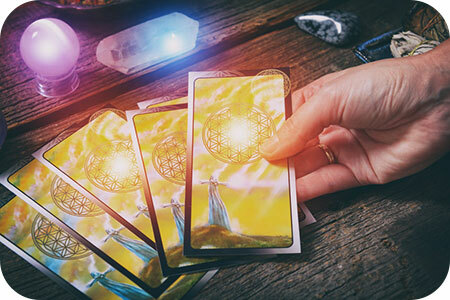 There are many gifted readers on Psychic Access and I would encourage you to select one of them based on your own research, in order to have the best experience.